Looking through an old recipe book of my Mother’s for something tasty to make I came across these biscuits. They always looked impressive after they had been wrapped round the rolling pin and they do taste nice. You need to make up the mixture and leave it for 30 minutes so no need to put the oven on until after that unless you are cooking other things. Next week’s recipes is for a marbled cake and I used the three egg yolks left over from this recipe in that. 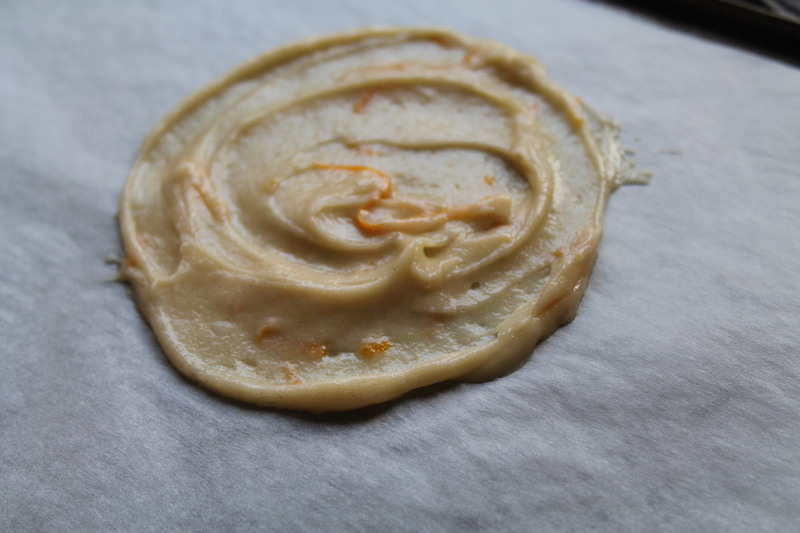 Whisk the icing sugar with the egg whites lightly and then stir in the flour orange zest and melted butter until well combined. Leave the mixture in the bowl covered with a tea towel for half an hour. Set the oven to 200 C, 400 F gas mark 6. Grease or line some baking sheets, then place three teaspoons of mixture on one baking sheet spread apart and stretch each spoonful into a larger, thinner circle. Continue with the other sheets and bake for about 10-12 minutes until just starting to go brown around the edges. 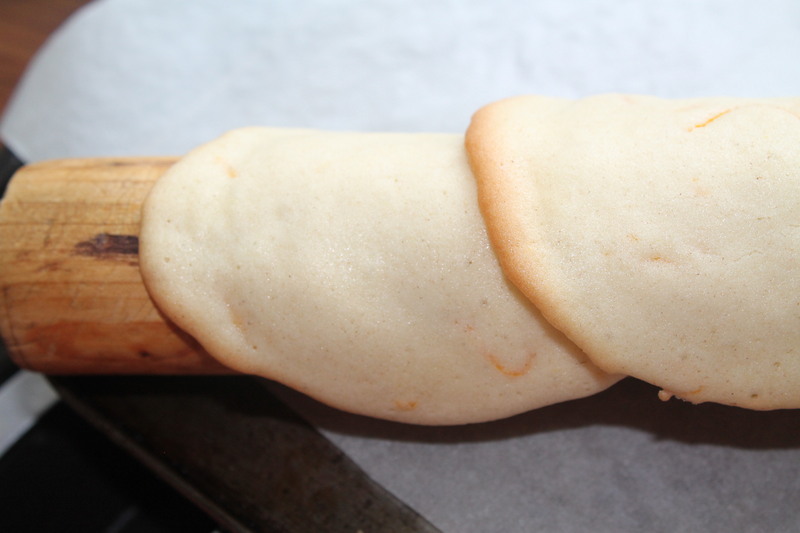 Whilst still hot from the oven wrap each biscuit around a rolling pin to curl and then leave to set. Just as with brandy snaps, if they go too cold they will break rather than curl, in this case you can just put them back into the oven for a minute or two to soften again then they will curl nicely. Continue with until you have used up all the mixture and then leave them all to go cold. They will store for up to one week in an airtight tin. 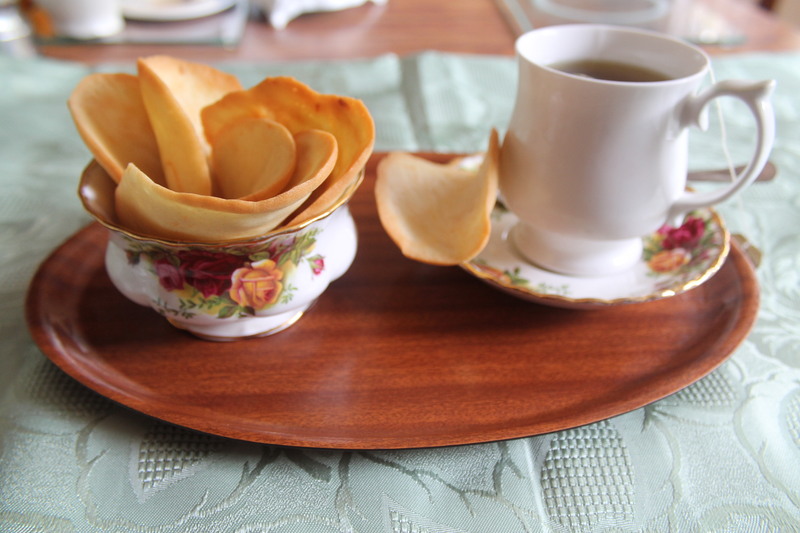 Serve with a good cup of mint tea and your guests will be most impressed.